collection of Memoirs "Being a Jew in USSR"
Memoirs as a genre of personal recollection shed light on the wide gap between official Soviet ideology, its application to the realities of Soviet life and behavioral patterns of Soviet bosses. Many of such books were self published in small quantities, and they are disappearing rapidly. Our goal is to save those valuable insights for future generations. Digitized books will be accessible online. This collection started modestly by books donation from the Foundation members and authors. “Soviet” Jews were employed in many industries, in research and engineering, in health care and art. Their recollections contain wealth of interesting information and unknown details how Soviet system was run. Some books provide fascinated details about Stalin’s purges and the atmosphere of terror, which shaped life in USSR from Revolution years till Stalin death. Authors also convey facts about systemic antisemitism flourishing on all levels of Soviet hierarchy. Please help us - send copies of published and self-published books and digital files of books and manuscripts. Chazan, Aaron "Deep in Russian night"
Historical record of Jewish life from the time of revolution. Book courtesy of Michael Levin. Draitser, Emil "Shush! A memoir growing up Jewish under Stalin"
Goldberg, Issai "Journey of self-discovery"
Book courtesy of Leon Vayn. Karlikovsky, Yuri "Small rock on tombstone"
Kuperman, Iser "The fate of the champion"
Memoirs of famous checkers master about his life in USSR. The author provides interesting details about inner working of of Soviet checker field controlled by the State. 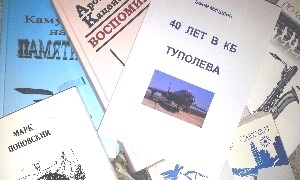 Levenstein, Victor "The story about my father"
History and investigation about the persecutions in USSR, including a story about Levenstein family from Novo-Poltavka. Book courtesy of Victor Levenstein. Mindlin, Yefim "40 years in Tupolev's firm"
Stories about life and work of aviators. Book courtesy of Mindlin's family. Mirkina, Galina "Captured by memory"
Story of Jewish family from Khotimsk, written by victim of Holocaust. Mulyash, Maria "With love to you"
The famous manager of MosConcert collected stories about her family, friends and well known actors. Book courtesy of David Shenker. Okunev, Yuri "Saga of the risen from the ashes"
Segal, Peter "You shall not make idols"
Book courtesy of Segal's family. The book describe life of particular Jewish family, Svirskiy, in USSR in middle of 20 century. Author telling personal stories about his family and friends deaths and survival during World War II, Stalin repression, and Anti-Semitism after war. The author was born and died in the USA, yet the greater part of his life was spent in the USSR where he observed the worst events of Stalin's reign. Book courtesy of Inna Talmy. Teperov, Philip "Maraphon on the life"
Book courtesy of Teperov's family. The story of Aron Rabinovich written by his grandson about the life of typical Jewish-Soviet boy in Ukraine. Book courtesy of Vera Lerner. Zilber, Yitzchak "To Remain a Jew: The Life of Rabbi Yitzchak Zilber"
"Let you continue to be Jew in this cold condition" -the main idea of rabbi's book. Book courtesy of Gregory Milstein. Recollections of eyewitnesses of the WWII nicknamed "children of war". Disturbing stories.Unique accounts.